The Pyle PT390AU Digital Home Stereo Receiver brings music to any room with crystal clear clarity. This four channel high-power system powers up to 4 speakers -- for all of your home theater entertainment needs. 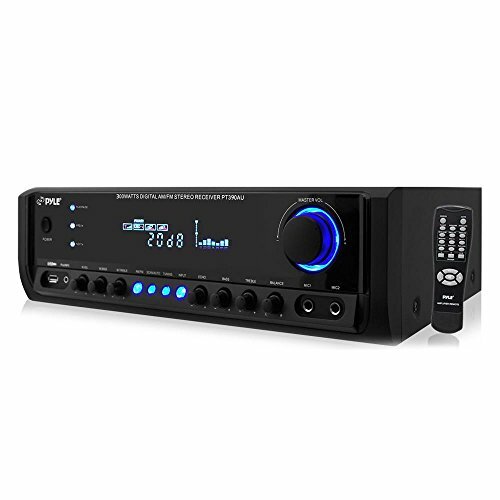 System features include AM/FM radio with 50 station memory presets, USB reader for MP3 digital audio file playback, Aux (3.5mm) input to connect external devices like smartphones and tablets, (2) 1/4'' microphone input jacks along with RCA audio inputs and outputs. Connect some mics for a karaoke party and adjust the volume, balance, treble and bass on the master output for total control of your sound. The system also includes AM/FM antennas, remote control and audio connection cable. Enhance your entertainment experience and connect it all with the Pyle PT390AU Digital Home Stereo Receiver. 1 Check the Speaker voice coil attached on the right channel - move left speaker to right channel to see if the issue follows the speaker or the channel. If it follows the speaker the speaker will need replacement if it follows the channel then the amp may need service. 3) Remote Control: Unit has a manual Push button on/off button on the unit itself, so it will not have ability to power on/off on the remote control. 4) Channel/Noise Issue: Rotate the speakers from one channel to another, If it follows the speaker the speaker will need replacement if it follows the channel then the amp may need service. 5) Unable to power on the unit: Test/replace AC inline fuse. If the unit powers and works normally then no problems if the unit blows the fuse and shuts down again then it will require service. 6) RCA line input: This model does not have built in CD player. Referring to CD RCA line input, as for the Radio make sure the Antenna is properly installed. DISPLAY METER: The compact and rack mount amplifier has a built-in digital LCD display meter which displays all the functions and input used. Antenna, audio cable cord, remote control are also included in the package for distant audio adjustments.